The Sobibor Death Camp was the second extermination camp built by the Nazis as part of the secretive Operation Reinhardt -- with intent to carry out the mass murder of Polish Jewry. Following the construction of the extermination camp at Belzec in south-eastern Poland from November 1941 to March 1942, the Nazis planned a second extermination camp at Sobibor, and the third and deadliest camp was built near the remote village of Treblinka. Sobibor was similarly designed as the first camp in Belzec, it was regarded as an 'overflow' camp for Belzec. This account of the Nazis' remorseless and relentless production line of killing at the Sobibor death camp tells of one of the worst crimes in the history of mankind. Chris Webb's painstakingly researched volume ranges from the survivors and the victims to the SS men who carried out the atrocities. What makes this work special is the research which has been gathered on the survivors, who by good fortune, courage, and determination survived Sobibor and built new lives for themselves, new families, but bore the scars of this terrible place for all of their lives. Closing a gap in the existing literature, Webb focuses on the victims and presents details of their lives which have been found and re-tells them to keep their memory alive, to show they are not forgotten. The cruel and barbaric murder process is described in great detail, as well as the confiscation of the valuables and possessions of the unfortunate Jews who crossed the threshold of this man-made hell. One cannot fail to be moved by the personal accounts of those who survived, their loved ones perished in this factory of death. 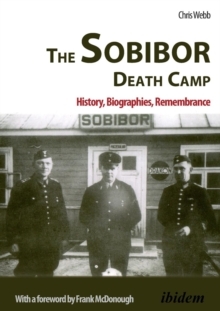 The book covers the construction of the death camp, the physical layout of the camp, as remembered by both the Jewish inmates and the SS staff who served there, and the personal recollections that detail the day-to-day experiences of the prisoners and the SS. The courageous revolt by the prisoners on 14 October 1943 is re-told by the prisoners and the German SS, with detailed accounts of the revolt and its aftermath. The post-war fate of the perpetrators, or more precisely those that were brought to trial, and information regarding the more recent history of the site itself concludes this book. There is a large photographic section of rare and some unpublished photographs and documents from the author's private archive.